Dr. Haber offers three specific anti-bullying programs to help you, your children, your employees and staff to understand the fundamentals of bullying behavior. Dr. Haber is passionate about resolving the issue of bullying. As a bullying expert and founder of RespectU, his knowledge has allowed him to develop three very effective anti-bullying programs that he can help implement in your business, school or organization. Bullying is unique in the sense that it can violate school/workplace policies, civil statutes as well as criminal laws. Unfortunately, the surfacing of new forms of bullying which extend outside the confines of the school walls, bullying has the ability to infringe on the privacy, safety, psychological health and civil rights of anyone, of any background, of any age. When Dr. Haber developed his anti-bullying programs, he was able to draw on over 20 years as a clinical psychologist and behavioral pattern specialist to pinpoint effective methods to teach and train educators, business owners, parents, the bully and the victim. Dr. Haber has consulted with many companies and educational institutions on ways to identify and stop bullying in the workplace, at camps, in the schools and at home. Learn where to focus your efforts and reduce bullying. 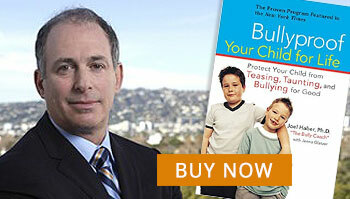 Dr. Haber will show you how to maximize the time spent on bullying efforts without wasting valuable time in other places. As a employer, counselor, educator or parent, you will need to manage the way you deal with bullying from the beginning. You will learn how to set the stage for how future interactions with your staff, employees and youth around bullying and life problems will move forward. The success of Dr. Haber’s anti-bullying programs and gained him national and international recognition. Through this recognition of these programs to prevent and stop bullying, Dr. Haber has been able to make a real difference in how we look at bullying behavior and how we approach to reconcile that behavior.